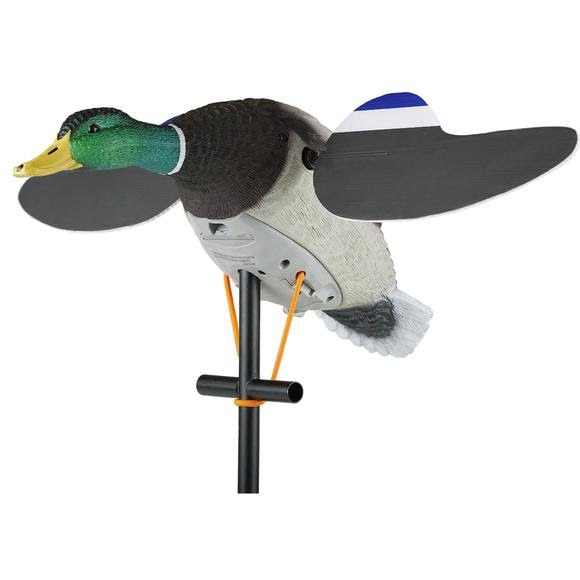 Lucky Duck's Lucky Junior II 6V is a spinning wing decoy with exceptional detail. Made of durable EVA plastic that resists cracking and holds paint adhesion for even the toughest waterfowler. Our chest mount with bungee makes this decoy hassle free and mobile. The Junior II 6V includes a 3 piece 42 inch stake, magnetic wings, 6 volt battery, and smart charger. Lucky Duck&apos;s Lucky Junior II 6V is a spinning wing decoy with exceptional detail. Made of durable EVA plastic that resists cracking and holds paint adhesion for even the toughest waterfowler. Our chest mount with bungee makes this decoy hassle free and mobile. The Junior II 6V includes a 3 piece 42 inch stake, magnetic wings, 6 volt battery, and smart charger. Decoy will run 18+ hours and is HD remote ready (old separately).